You Will Feel the Hook! 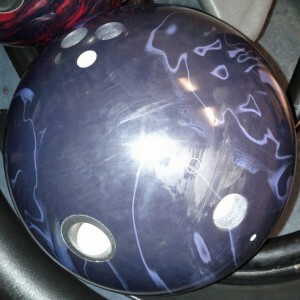 Buy the Brunswick Aura Bowling Ball from Bowling.com! This layout will generally get into a moderate roll with a slower transition at the breakpoint, while offering high track flare potential and more axis rotation. I really like that Rough Buff factory finish. You can tell it will allow the ball to get decent length while not destroying that big backend move that low grit finishes tend to do. It looks like one of those high end balls with nice hook potential for many bowlers. For Mikey, it was hooking the house! I’m going to start being even more critical on the value proposition since so many medium and low end balls are quite high performing. However, this is a high end ball that has teeth while still offering a smooth but strong backend motion. This type of reaction tends to be versatile, more so if you are a lower rev bowler on the typical medium to lighter volume conditions. 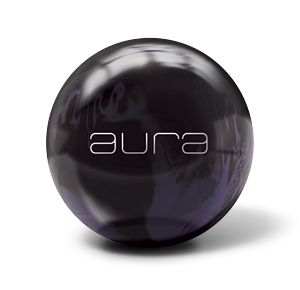 Again, Brunswick has dug deep with it’s naming conventions here using the Aura Ultra Low RG core. The Minimum RG is 2.469 with a differential of .052. This is going to be an earlier rolling core. Combined with the cleaner cover, this allows this ball to retain a fair amount of energy for backend motion. The cover is called Optimum-Flip Solid. It’s finished with 500 Siaair and Rough Buff which gives it a slight sheen. We didn’t alter the factory finish for our testing. Brunswick touts a whole thing about brand new cover, new core, etc. What was very clear is that this ball fits very neatly between the Nexxus f(P+R) and Nexxxus f(P+S). Brunswick indicates that this is their most continuous ball they have. Honestly, the Nexxus and Nexxxus are pretty continuous motions and I think it’s a little tough to discount them. The Aura was basically cleaner than the Nexxus through the heads but not quite as clean as the Nexxxus. It makes perfect sense and really does offer good length for a solid ball. I know Mikey hooks the whole lane, but most of us will not be doing that. We want a ball at this level to handle decent amounts of oil, and have a consistent and strong move from the breakpoint. This ball rarely blew past the breakpoint. It did have a rolly and heavy move on the backend. The Nexxus is more rolly and heavier into the pocket. I think a ball like this is a good option to have in the upper end of your bag. You would just have to decide if you really need these 3 aggressive pieces and still leave room in your bag for some medium performance equipment. Overall, this ball has a nice look on lane. It is nice to have a solid coverstock ball that doesn’t hook at your feet. So if the conditions were right, and you started with this ball and it started to break loose a tad early, the Nexxxus would be a perfect stepdown. As you can see from the tracks and specs, the Aura fits very neatly in between the Nexxus f(P+R) and Nexxxus f(P+S) in terms of overall board coverage and angle to the pocket. Hook Power is a little tricky here since Mikey had to really lay off the Nexxus f(P+R) because of how much it was digging in. Nevertheless, you can see that the Aura covers lots of boards for someone with lots of hand while still generating good entry angle. The Brunswick Aura is another nice offering from Big B. This ball offers reasonable length while still maintaining good overall strength. The cover will likely allow it to be a bit more versatile than the solid Nexxus. For those that found the Nexxus a bit too much, this would be a good option for the top of your arsenal. If the Nexxus was way too much, than odds are so will this one. This is still a strong ball to be sure. Really an excellent step up from the Nexxxus. Since we really liked the Nexxxus, that’s saying a lot.